Good chair designs can also be good art, and the Haline Dining Chair proves it: The shapes are simple, refined and designed for human comfort. You walk around this modern dining chair and find yourself admiring its shape harmonies from every angle, just as you do with a freestanding sculpture. Every detail -- the cutout hand-hold on the back, the row of 3 polished connectors below the rear seat edge -- contributes to the artful flair. Classy, stylish, quality is excellent - fast shipping, everything went smoothly and they look great! 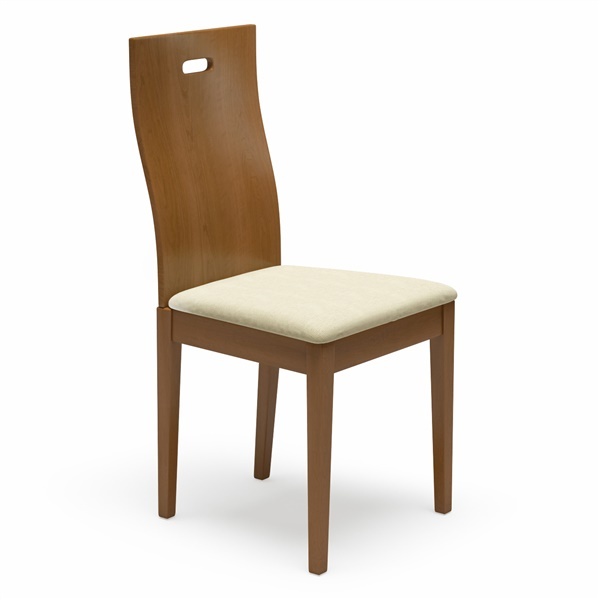 Sophisticated, adds a classy touch to the dining room - has that transitional style to it that fits well with many settings, an excellent find! Definitely a classy and contemporary design, it gave my dining room a more sophisticated and modern look. Plus, the cushioning on the seats and the curved backrest are amazingly comfortable. I purchased 4 chairs to go with an Inmod round dining table. Assembly was pretty straightforward, except that with three of the chairs I found it necessary to re-drill some of the holes in the seat cross braces to allow proper alignment with back leg mounting bolts (some holes were off-center to the point that the back legs were positioned too high to allow the seat back to be mounted). Apart from extra work required, the seats are well designed and very sturdy. The "walnut" finish is not quite the same as the "walnut" of the table, but they provide a nice match nevertheless. ProsGood chair overall design. Seat height proper fit. Seat backs comfortable fit. Apart from some re-work required, assembly instructions were clear and straightforward. ConsSome re-work required to get proper fit of legs to seat. A comfortable and sophisticated design. Item is high-quality and customer service was very helpful! These chairs are lovely. They arrived on time and very well packaged. They look just as in the picture. Giving it 4 stars because hubby had to do some figuring out with how the legs go on and it took about 2 hours for one chair. Also the pins in the back were not aligning with the holes because the legs weren't on right so hubby had to do some taking apart and reassembling. But on the whole very decent buy. Classy and chic looking with our dining table. ProsLooks very classy and contemporary. Just as shown in the picture. Nice wood back and cream leather seats. ConsAssembly was a little tedious but once you figure out the legs and pin alignment on the first chair the rest goes fast. what other colors are available in the seat fabric? what is the seat material made of? This chair is only available as shown. We do not have other seat cushions. The fabric is a polyester linen blend.